The truth of who we really are has been lost in the womb of culture. We must now understand the womb of culture and change how we create in the physical world. The secrets that we seek are buried in the traditions of our past. The complexity and hopelessness that has evolved within society melt away as we begin to remember the simplicity of our nature and begin to see what life really is. Only then can we uncover the sacred self and begin to understand the creation process here in the physical plane, so that we can create our future in alignment with our true self. Labels: Chuck Smith, Who Am I? We create a life of our own design when we are balanced. Being balanced allows us to exercise our free will. Free will is what allows us to create the rainbow of experiences that we do in this life. Free choice comes from unconditional acceptance of the Self. How often do we NOT feel like we have free will? We feel like “something” is preventing us from being able to choose a life of our own design. That is because we are not balanced. We do not understand the “pattern of creation” which is the basis for ALL that we create, the laws that we are using to create within, nor how to balance ourselves. Balance/Beauty are self-defined. Individualized. Are we living a life of balance and beauty (relative to ourself)? Understanding, applying, and mastering the first four tenets allows us create a life of our own design. Our blocks and obstacles to living our “life in alignment” are created by the judgment we have on others, which causes us to judge ourselves even more harshly. Judgment is one of those things that we all know we shouldn’t do yet rarely can we see when, and how often, we actually do it. We think we are not judging and then we find a way to judge in a different way. The reason that not judging is so important, is that any time we judge, we are not practicing 100% responsibility. That means we are limiting ourselves in some way, preventing ourselves from fully expressing. We are allowing blind spots to keep us from achieving those things we most desire. We think that judging is about the other person, which is deceiving because it is really about us allowing others to affect the experience we are creating. We are giving away our power to create by saying that anyone else’s actions can limit us in anyway. We then limit our actually limiting ourselves. If we truly believe we are 100% responsible for our experience then nothing that anyone else does can limit our ability to create what we wish to create. If we are not balanced internally, then we are balancing ourselves with the energy of others. Energy must always balance. Always. Ideally, we want to be balanced within ourselves. Then, when we are in relationship of any type, then we are building a collective energy that is balanced. This is a firm foundation from which you can create incredible things in this life. If you are not balanced internally, then you will be constantly balancing your energy with the energy of others. This is called co-dependence. The word co-dependent is usually looked at as being less desirable. However, there can be many instances where this is a very good thing. The important distinction is that you are aware of the fact that you are balancing the energy externally. It is based upon a choice and not an unconscious need. A healthy co-dependence can bring stability to an individual so that they can feel comfortable (less fearful) about doing the inner work necessary as they progress along their chosen path. In a group or organization, this co-dependence can bring stability and a firm foundation to whatever vision is being created. If the energy is not balanced in the individual or the collective than anything created from that point may be unstable. It’s important to always look to balance the energy before any creative endeavor. Our mind creates from our true spiritual self, AND from any laws that we have taken on from our culture and past experiences. There is a structure in the mind that can be learned that drives the manifestation of our physical experience. It is the same for everyone, and for every group, or collective energy. Understanding this structure and the source of the laws that are in use to make decisions, allows us to be able to correct ourselves when we are not getting our desired result/feeling in our experience. Our mind creates our experience within the boundaries set by LAWS. That includes Spiritual laws, natural laws, and those laws that we have taken from our culture and past experiences. Spiritual laws and natural laws are absolute. The other laws are changeable and are based on our agreement (conscious and unconscious) to abide by these self-made laws. There is no right or wrong. The only measure we use is whether we are living the life that we desire or not. We are 100% responsible for creating our life experience. In order to be able to create our experience, we must understand that we are 100% responsible for everything in our life experience. There are no exceptions to this. Whenever we seek to blame anyone or anything in our experience, we are separated from our ability to create the experience that we desire. This is the most important part of being able to create a life of your own design. Heredity, environment, family and culture all have an influence on our experience and may teach us options of how to create yet it is only we that have the power to create our life experience. Any other belief takes away our free will and binds us to repeat the same pattern of experiences over and over. This can be very difficult to really see and understand. It also takes great courage to accept this fact and to act accordingly. The flip side to understanding and living from the point of being 100% responsible is that you can stop taking on the feeling of being responsible for others. The majority of humanity puts a lot of energy towards feeling responsible for others when they have no ability to actually help or fix that person. The only thing we can do is to bring awareness, and then it is the individual’s choice as to what they do next. They are 100% responsible for their experience. Life is the great teacher and will continue to bring back to that person experiences to help them learn. They however must be open to learn. Help to bring awareness to others when you can, and then release them to allow Life to be their teacher. The major difference between mankind and the animal kingdom is free will or volition. The only creative process there has ever been, is now, or evermore shall be is thinking. I find it very interesting as I reflect on these three statements, how many people don’t really understand how they create their life experience. For the most part, humanity actually does function more like animals because they don’t understand how their mind functions. Everything in our life experience is created by our mind. However, most people don’t understand how the mind works and how it creates. When you are not balanced, then you are not able to make choices or to exercise your free will. You are not able to think clearly and make decisions that will create your life experience. Therefore, you are left with a life by default, driven by past experiences and current challenges, versus freely choosing the life you desire. When someone does gain an understanding of how the mind creates, then looking at the challenges that come our way, actually allows us to Self Teach, and to grow from each experience. Those things that happen “for us” are actually generated by the part of our mind, which is out of balance. There is a direct relationship between the nature and intensity of what is out of balance in our mind, with the external experience we have created before us. It’s fascinating once you begin to see and understand the pattern of how the mind creates. All the teachings and philosophies that you have learned all of sudden can be applied versus just learned. That not only applies to the spiritual philosophies, it also applies to any type of training related to career and personal growth as well. As we understand the pattern of the mind and the laws from which decisions are made, we are then able to ensure that we are using the laws that will create the life experience we desire and that we do so from a balanced perspective. As the physical world changes, we will change with it. It's always the balance between our perception of the energetic and the physical that is important. When our perception of things gets out of balance is when we may have difficulty maintaining our desired vibration. That's why I always find it helpful to look at things from an energetic perspective and a physical world perspective simultaneously and look for the perception which allows me to maintain my desired vibration. As the physical world changes, then my actions will remain vibrationally balanced. As long as we are in a physical world experience, then I'm not sure the aspects of perception and perspective will ever go away. That is what brings the richness to our experience. Feeling that we need to do what is "right" implies that there is right or wrong. In the physical world "right" is relative to a perspective and other energetic entities may have different perspectives and different relative ideas of "right". The harmony in the world will come from understanding and honoring the multiplicity of consciousness, relaxing judgement on others and ourselves, and allowing the multiple perspectives to all have equal weight, and most importantly being sure to honor and respect our own perspective. 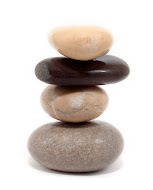 We know that to create in an easy and effortless way, we as individuals need to be in balance. We need balance to walk a life in alignment. As we talk about and try to understand what balance is, we can say that balance equals beauty. So then what is beauty? This definition says it all. beau·ty [byoo-tee] noun, plural -ties. As with tires on a car, we first balance the individual tire, then, after we put the tires on the car, we align the car and the tires so that the car rolls easily and effortlessly. That is how it is with life. We must first balance our self, then, look to align ourselves with other people and things in our life so that we find beauty (balance) in all that we do. Everything we experience is a reflection of our mind. Our definition of beauty is relative to our mind, and therefore individualized to each of us differently. Balance is different for every person based on who they are, their true self, and based on their circumstances…what things around them are they are trying to align. We know we are not in balance if we are not producing the results we want in the physical world and/or we are not achieving the feeling we want to be having in our life experience.